Please take the time to exercise your citizenship ESPECIALLY if yer under 30years old. Your vote COUNTS. I live across the street from the school which is our polling place, so I grabbed a little knitting and headed over there at 7 am. I ran into my friend Niki so we amiably chatted in libe for 45 minutes. There was some grumbling because there were supposed to be 3 lines – A thru H, I thru Q and R thru Z, but since there were no signs or “velvet ropes” to keep people separated, there was a bit of a set to because somebody supposedly cut in line…..ah yes, we are all grown ups here, I think. I was DELIGHTED to see so many people out to vote. Some had brought chairs, several people had books or newspapers, but mostly, folks were chatting with each other. I saw many of the people I know by sight who live in this part of town, and several people were taking pictures – it did my heart good. 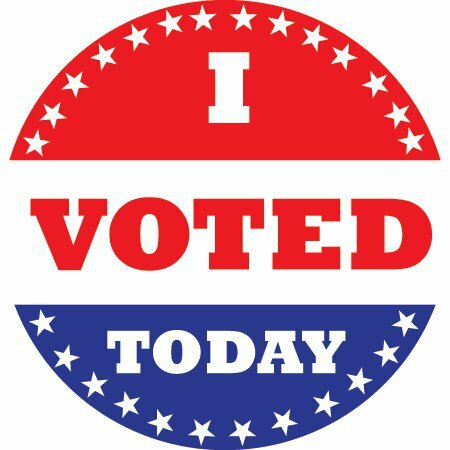 And I thank everyone, both now and in the past, who has worked and sacrificed so that I and everyone else in the United States CAN vote. FYI – most polling places close at 7 pm; if you are not in line by 7 pm, you won’t get to vote. Posted in blessings, knit/yarn and tagged knitting, vote on November 4, 2008 by helenkosings. I’ve been under the all-too-gorgeous weather part of yesterday and all of today (a hormonal thing…. ), but that means plenty o’ knitting time! I started the 4th skein of the Silky Merino thinking I would just finish that repeat….well I knitted another repeat (was 14? or 15?). 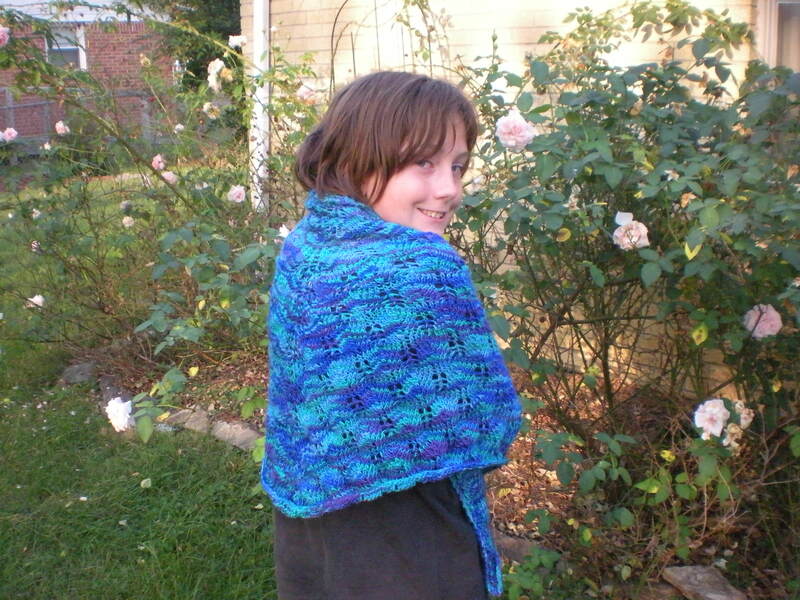 This pattern is such fun and the yarn is so yummy it’s easy for me to forget all my resolve. So I could tell I was getting down to the end of the skein, and after looking at a bunch of finished triangles on Ravelry, changed my mind and decided I would do the edging after all. Problem #1 – I’d given back the book to whom I had borrowed it from without copying the pattern. Of course I could go to the library….but this was Saturday night about 1 am so that wouldn’t suffice – I think the library folks would be a little upset if I broke in; if they were all knitters of they’d understand why. I had looked carefully at the chart, and there are lots of wonderful pictures on Ravelry, so I got out the graph paper and came up with the edging – if not the exact edging, durn close to it. Off I went knitting merrily. Problem #2 – I got done with the smallest part of the edging I could get away with and have it look ok and realized I had 12 inches of yarn left! What to do for a bind off? AHA! 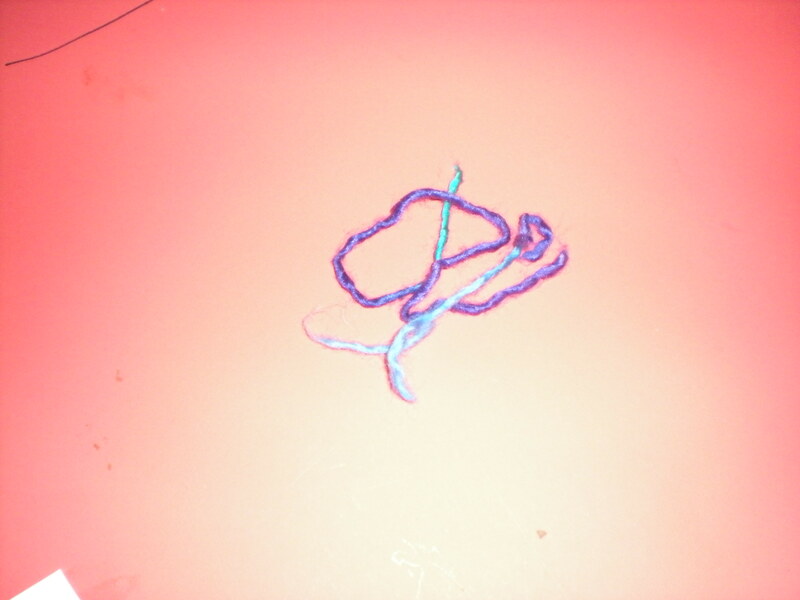 Got out a crochet hook and linked all those loops together. It seemed a little firm but I figured it would loosen up in the blocking. This is all the yarn I had left! Did the whole soak and spin dry thing (thank you Priscilla Gibson-Roberts) and got out my old cardboard cutting board and 240 t-pins I got at Wal-mart (that was all they had) to start blocking out on the patio. Problem #3 – It’s too long for the board. I decided to go ahead and block what I could – this board is great because it has lots of straight lines marked on it. 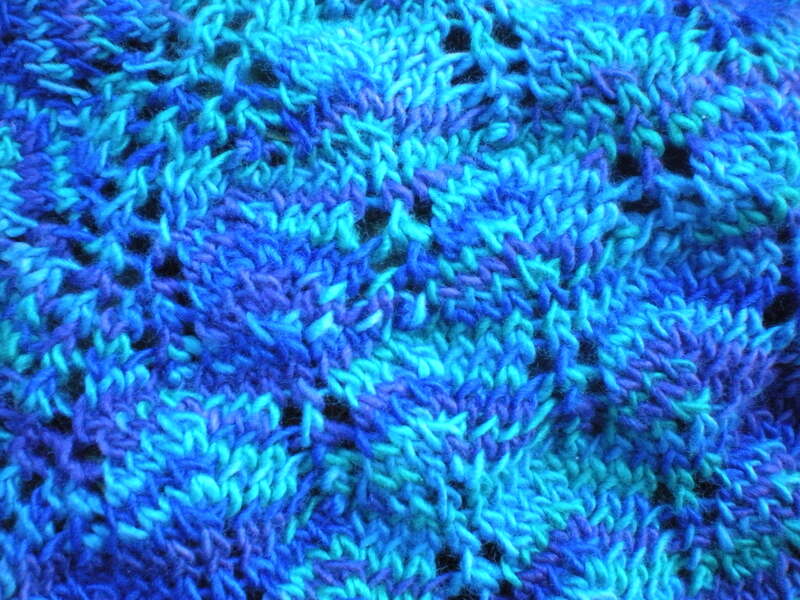 Problem #4 – The bind off is SO not stretching out. I took out all the pins I had tortured this poor shawl with (probably 150 of them) and hung the shawl up on the line to dry. I cannot block it as it is, and I cannot leave it as it is. AAARGH! See how the too tight bind off is making sort of a pouch? Not good. The color is pretty accurate in this picture by the way. 1) frog back the edging and just bind it off at the last repeat? That means no edging. 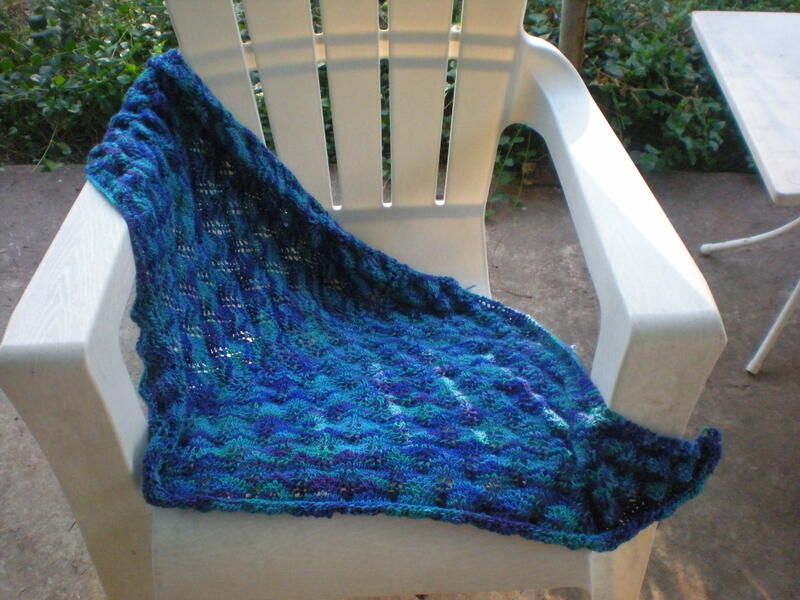 2) frog back the edging and a pattern repeat, then knit the edging and bind off? 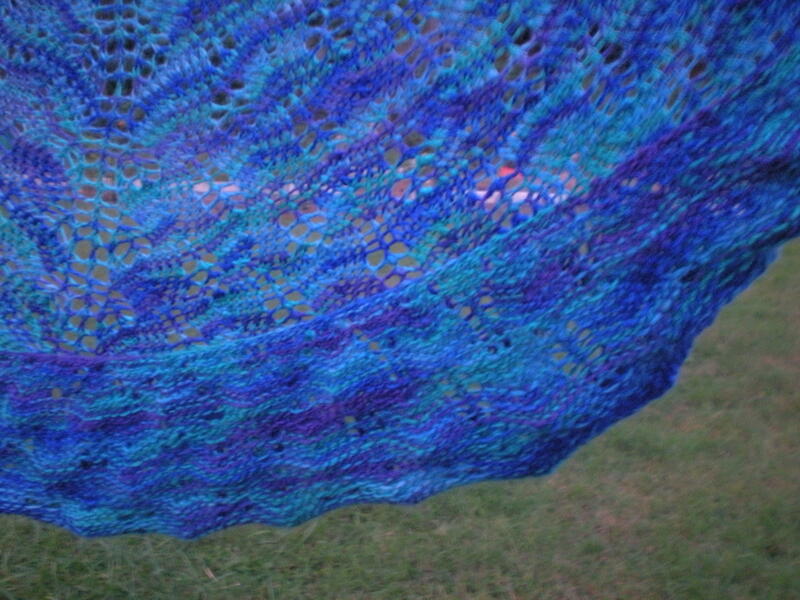 That means a smaller but complete shawl. 3) wait two weeks til I can afford to buy another skein of the yarn (I’m on a yarn budget now), then finish off the edging and bind off? 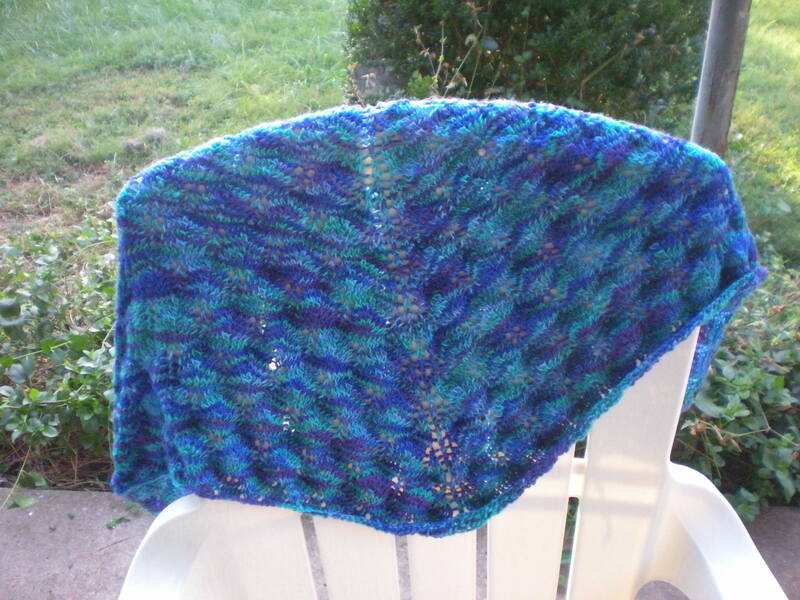 That means waiting, but I’ll have a larger and complete shawl. Leave your vote in the comments and I’ll keep you updated on the outcome. By the way, I am knitting one of the Dwarven Battle Bonnets for Franklin Habit as a result of the last vote (it was unanimous!). I’ll post some pictures soon…..